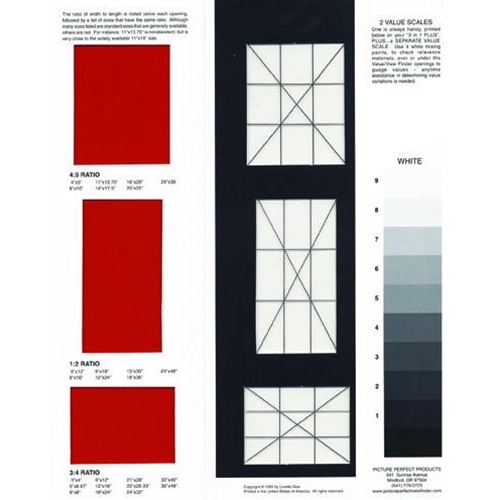 This is a simple yet very useful tool for all visual artists. 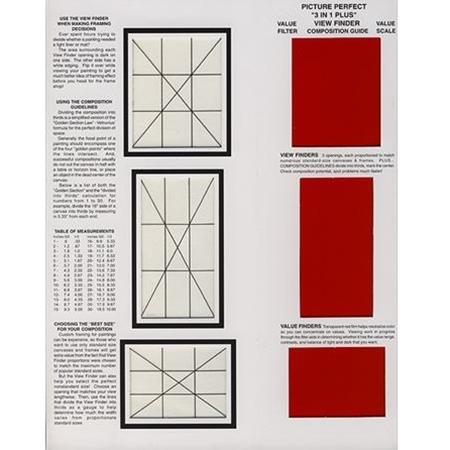 There are three value filters/view finders in transparent red (the red film helps to neutralize colors so you can concentrate on values), three clear gridded viewfinders that help you to find your best composition, and two printed gray scales that go from white to black (one printed on a separate insert). 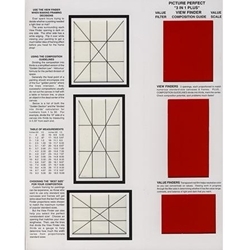 There are also printed ratio finders, a table of measurements, instructions for choosing the best size for your composition, instructions for enlarging or reducing using a graph, and more instructions on using the Three in One Plus View Finder. Printed on heavy duty, bi-folded card stock. When folded, the View Finder measures 5-1/16x11 inches.